Japanese soy sauce is made from a fermented mixture of wheat, soybeans, water and salt. These ingredients are combined with mold (Aspergillus sojae), yeast and lactic acid bacteria in a complex process to create a mash. The mash is matured, pressed and filtered to produce the finished product. Precursors to modern soy sauce developed in East Asia more than 2,500 years ago when meat and fish were preserved by packing in salt. The liquid that leached from the preserved meats was used as a base for broths and seasonings. A number of different condiments, including fermented soybeans, eventually developed from these techniques. Around sixth century AD, Buddhism flourished in both Japan and China. Many Buddhists were vegetarian, which heightened a need for meat-free flavorings. One of the popular seasonings in China during this period was a salty paste of fermented grains, including soybeans, which is the first known product to resemble modern soy sauce. According to tradition, a Japanese Zen priest studying in China came across the seasoning and, upon returning to Japan, began producing his own version. Over the centuries, Japanese breweries developed the brewing techniques and ingredients which we enjoy today as soy sauce. Soy breweries eventually spread throughout Japan, reaching a height of about 10,600 breweries in 1888. The number dropped to 8,000 just after World War II. Since then, there has been a rapid decrease in the number of breweries: there were 3,135 in 1980, and there are fewer than 2,000 today, with centuries old breweries being lost at a rate of 1%-2% annually as a result of market consolidation by the largest five producers. Economic pressures, combined with the retirement or death of many of the owners and older brew masters, have accelerated this process. A variety of soy sauces are made throughout Southeast Asia. Japanese style soy sauces are generally divided into five main categories based on differences in ingredients and techniques of production. Japanese soy sauces include more wheat as a primary ingredient, which tends to give them a slightly sweeter taste and a somewhat sherry-like flavor compared with soy sauces from other countries. At the most basic level, Japanese soy sauce is made through the fermentation of four simple ingredients: wheat, soybeans, water and salt. These ingredients are combined with a specific mold (Aspergillus sojae), yeast and lactic acid bacteria in a complex two-stage brewing process that can last for as long as three years. The resulting mash is pressed and filtered to produce the finished soy sauce. Variations in the ratios of ingredients, methods, aging and the strains of micro-organisms create an enormous variety of flavors and quality. Koikuchi is the most common style of soy sauce in the world and has become the standard flavor profile. Popular brands such as Kikkoman and Yamasa are koikuchi soy sauces. Koikuchi is produced from roughly equal quantities of soybeans and wheat with a salt content of around 16%. Koikuchi developed in the Kantō region of Japan around Tokyo, and eventually spread throughout the country. Koikuchi accounts for more than 80% of Japanese domestic soy sauce production. Koikuchi is also called “kijōyu” or “namashōyu” when it is not pasteurized. Usukuchi is the second most common style of soy sauce in Japan and is saltier and lighter in color than koikuchi. Usukuchi often includes fermented rice, wheat gluten or amazake, a sweet liquid made from fermented rice amazake. Usukcuhi typically contains18 to 19% salt. Tamari is mainly produced in the Chūbu region of Japan. The principal ingredient of Tamari is soybeans, and it has very little or no wheat. As a result, it is much darker in color and has a stronger flavor than koikuchi. Tamari is the “original” Japanese soy sauce, as it’s recipe is closest to the soy sauce introduced to Japan from China. Tamari is often used as a gluten-free substitute for other soy sauces. Shiro, also known as “white” soy sauce, is most popular in the Kansai region of Japan. 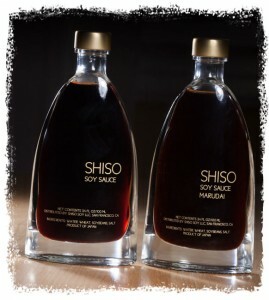 Shiro soy sauce uses wheat as the principal ingredient and has very little soybean. As a result, it has a lighter color and sweeter taste than other styles. In addition to the flavor, chefs often use Shiro to enhance the appearance of food and prevent discoloration or darkening of food. Saishikomi, also called “twice-brewed” soy sauce, originates in south-western Japan, particularly the Yamaguchi prefecture. The recipe for Saishikomi substitutes previously-made koikuchi soy sauce for the salt and water normally used in the brewing process. As a result, it is much darker and more strongly flavored. Saishikomi is also known as “kanro” or “sweet shoyu”. 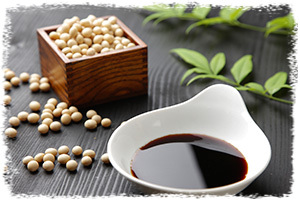 Marudai refers soy sauce made with whole soybeans instead of defatted soybean meal. Higher quality products such as Shiso Marudai are made with whole soybeans. Following WWII, the vast majority of soy sauces were made with defatted soybean meal. The defatted meal is less expensive and ferments much more quickly than whole soybeans. Whole soybeans, with increased oil content and longer fermentation times, leads to a smoother, softer and more complex flavors. The longer fermentation also increases the amount of glutamic acid, the primary component of umami flavor and mouth feel. Acid-hydrolyzed “Soy Sauce”. These truly awful industrial products that are marketed as soy sauce often come from China are generally used for single serving packets with take out food. These products have a very different flavor, aroma, and texture when compared to brewed soy sauces. They are made from acid-hydrolyzed soy protein in a process that takes around three days. Soybean pieces are boiled with hydrochloric acid for 15 to 20 hours. After most of the amino acids are removed, the mixture is cooled to stop the hydrolytic reaction. The amino acid liquid is then neutralized and pressed through a filter. Color and flavor are added to this hydrolyzed vegetable protein mixture using caramel color, corn syrup for sweetness, and salt. Low Salt. Reduced or low-sodium salt soy sauce, called “genen” or “teien”, is generally koikuchi soy sauce which has undergone a mechanical process to reduce the salt content to around 9 to 13 percent. Soy sauce is graded both by the Japanese Ministry of Agriculture, Fishing and Forestry (JAS) and an industry group called the Japanese Soy Sauce Association. Grading is based on the chemical composition soy sauce, mainly for amino acid and alcohol content. The Japanese Soy Sauce Association adds additional grades. Soy sauce is also graded by experts based on color, aroma, roundedness and other such more subjective criteria.